William Mangum, Sr., is believed to be the common ancestor of the Civil War Manghams whose experiences form the basis of this book. 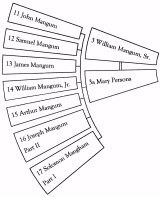 His father, John Mangum (often rendered as Mangham), is believed to be the first of this family to arrive in the colonies from England. He lived in Virginia by the late 1680s. CHAPTER II: MAKING A MARK IN DIXIE: WILLIS A. MANGHAM, WILEY P.
3. Slaughter at Sharpsburg; Surrender at Appomattox: Capt. John H.
2. Brothers in Arms: Col. Samuel W. Mangham and Pvt. William R.
3. Passing the Torch in Chambers County: Jane, John G., and Solomon R.
3. "The Ravenous Garfish Wax Fat": Sgt. Arthur G. Mangham, Jr. and Pvt. Wm. J. 3. "I Don't Intend to-Eat Rats!" Pvts. Francis J. Mangham and Thomas J.